Note: Please do not post direct answers - hints only - thanks! most comments of all times on EG24!!! Hope you all have fun as much fun as I had making. Don't forget to bookmark the solved levels or at least write down your answers! Thanks Small. Looking forward to lots of fun and frustration LOL!! Thanks for the riddle small. I won't be saying much. I will be too busy latching on to any hint left here, of which i hope there are many. Do i have a live one? Oh. My. Gosh. I am having a wee bit of trouble with level 7. Am I counting the right thing? Rungs or spaces? Oh dear. I get almost all consonants. I must be counting something wrong or missing an important step. It's in the alphabet going from one letter to another. Like the second letter is U because you go up 2 steps from the S.
Hi folks, thanks for the game. Oh thanks small-tool. I see I am going to need some coffee for this. is it in which direction the postman is looking or just the usual compass directions (like N=up)? For the right directions, look carefully at the pics! Nevermind. I got it! Thank goodness for a relatively easy one. lvl 12 granny s all you need, but answer is more than 4 letters, way more. Still live? The dog got sick. Anyways, i'm stuck at level 7. I thought you need to count the rungs, but it didn't work. Be sure to check everything on page of level 15! lvl 9, is it a google level? Dazz, most people count 1, 2, 3 4, etc. If you went from 7 to 15, then Yayyy you. Except for one thing. I reckon, given it's a Small-tool riddle, you will probably need ALL level answers. Nom- 7 is a pain. you do count the rungs but it is hard. magnify the page and that helps. Look for a popular name for a mountain. I'm struggling with 13 which is a directional nightmare. I keep trying new paths and no luck. I have looked closely at the odd compass points and have taken them into account. I've always wanted to go north on an Alaska cruise to see the polar bears. Any tips for my trip? I now counted several times, but it alsways comes down to bnfqfcqe. Even if i start with S instead of A, it doesn't make any sense. Hmpph. It's not B, but going up 2 from the S (in the alphabet) so it starts with SU. ah ha finally I reviewed a HS course to get to 14 which makes sense since I'll continue with it there. Thx for the riddle s-t! any clues for medium lvl III? Thanks for the hint, S-T! Unknown i'm right with you at the end of the pack. Like... i'm in Alaska while y'all are chilling in New York. Hotaru, on what do you apply what you find on the egg? Any help on 14.? Went to my HS class and used the chart to find meaning of numbers but just cant finish. Thought Ending was important on the 4 important things on the page, the url, the title, the picture and the final italics(9, 53,7,53, 16 1?) but I'm not getting it. Anyone still there? did you find what table to use mamam? Then look up the numbers + what they stand for. is lvl VII sth phonetical? Hotaru, not phonetical. Try google. Easy 13 ...not so easy. Any hints on the directional pictures? Makes it mixed up compass direction. oh thank you @Dutchie and @Cee Bee! Hello everyone, thanks small for the new riddle, its been a while. finished easy level but stuck on the first level of medium, tried counting and visiting granny any times but getting nothing, a little hint in the right direction would be great. any clues for med level 2? I do know the answer for 13 is NOT carameltaste and brute force the answer is harder than expected. Gotcha S-T....it seems like after I ask a question the answer suddenly appear! Don't know why that is. Do the first thing and read the hint the egg shows you. Find a way to look for the Italic word you read in the title in the rap-lines. I would like a hint myself for level Med-V please? Cee Bee Still On 14, I have the table, have decoded the numbers using it, but haven't been able to put all clues together for the answer. 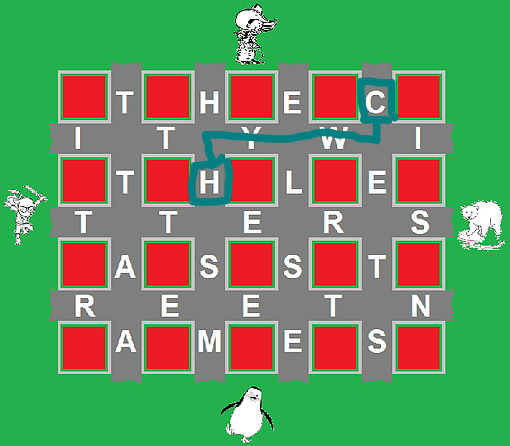 mamam, if you have the table and the letters that go with the numbers, they form a word. Did you found legs on your eggs Ceebee? AO...not so much power...I got the directions but must be doing it still wrong...the second directional hint and I run out of South steps. do your animals live on the correct continent? Med level VI. Combine what you see with the names of the colours. @AΩ there's a word that is different.. AO..I believe I have the pics correct but after the first set of directions I run out of South squares. I start with C and then end on E...no more South squares to go for next set of directions. Fruity rapper - look for something in each of the five long lines of test. And indeed, thanks Edgar and Ellie and Clio. Without them it would have been a terrible riddle with loads of mistakes and very poor English. Thanks Donas on the next level now. Thanks S-T for your great riddles, as great as expected! Now I got to lvl XI, but must stop for today. See you tomorrow! AO, I am not getting it. Is each "Square" a junction so "second juction South" means 'two squares down?" Failing miserably to solve egg III but have stumbled on the answer to XIII. found six eggs on VIII but only three have legs, any other hints please? 5 of them have legs, look carefully and maybe enlarge the pics. ok, so only found 5, had one written down twice. med III egg has an important word being shown, doesn't it? Go back to the level and to the text below the picture. There is a reason for that laaaast word. Gary, the phrase starting with 'Find ....' etc? If you're counting those, you're doing the right thing. Thank you Small Tool for the game. Is there a replacement site for riddler's I can go to that replaces the one I and you were members of but closed? reading backward? the only thing I see is evil = live? Nah.. got to stop. Only see orange. Nothing else. Sometimes (like in the first line) it's a word hidden in 3 words. ok so I am on second egg for XI have applied math to picture every which way, no luck, need a little push please. Robin: Use the first two numbers as the words in bold on the 2nd egg - then adjust by the 3rd number. You should find some special times. thanks cee bee, was looking at one but not using the math right. The colon means divide - do the maths. You need the part following the decimal point. tried that cee bee, only get gibberish, is it just the first digit after decimal? and what about zero, do I use an O in its place? any hints for XVII? not even finding an egg so far. ok giving up for the night, stuck on XVIII tried everything associated with b******* b****, numbers to letters highs and lows and combined, could someone leave a hint to push me in the right directions please. what's prominent is easy to see, less easy to find a word that makes any sense. Is the order girl first? what did kevin set for the intruders in home alone? I don't understand the egg on XV. Do I use the numbers on just the thing in red? trying to count legs now on 5 images for VIII. Not an easy task to get right! replaying and stuck on lvl 9 (easy path) , noticed the difference in the keyboard but how should the answer be? word? 2 words? Got stuck at lvl XI. No eggs yet. as an art lover, I just ♥ that lvl! only found 5 eggs - which one was the 6th? ftf of the title (only 3 letters)...? nope, the ftf level trick - ha! we almost have reached 200 comments...!